The definition of criticism in the dictionary is “the expression of disapproval of someone or something based on perceived faults or mistakes”. Have you ever been criticized? Do you think criticism will help a person to get better? What effect has criticism on a person’s self-worth and self-esteem? As for me, I have criticized others and I have also been on the receiving end. Neither one of them has felt good in the end. I either felt guilty or ashamed. As human beings we are easy to judge and to criticize others, especially if their way of thinking is completely different to ours. Criticism can also become a habit, which can be very detrimental for establishing good and meaningful relationships in our life. This is true at work but also in our personal life. Becoming aware that you are possibly not aware may help. I can honestly say that things have started to change tremendously for me when my two beautiful step daughters came into my life 8 years ago. For these 2 little girls I wanted to be the best person I could be. At that time I started to watch what I say and especially how I say it. Thankfully we have a wonderful relationship that it based on mutual trust and respect. Now they are both teenagers and I am convinced that our relationship will stay that way as they are used to having good conversations with us rather than being criticized. 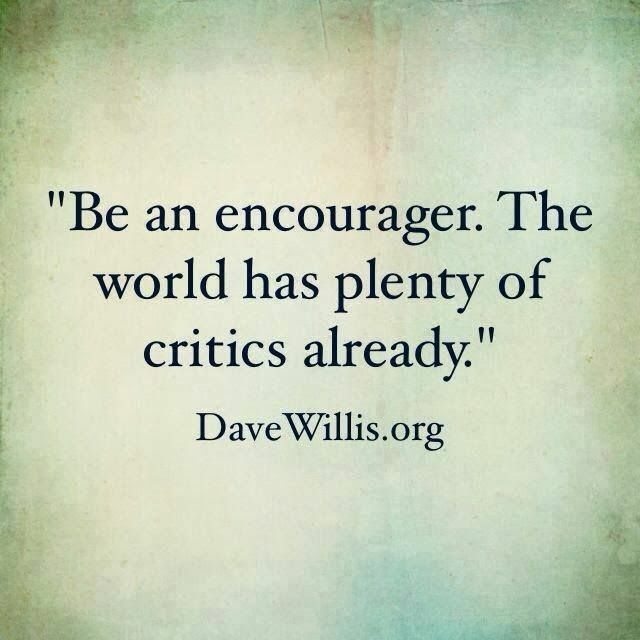 How can you make sure that you are an encourager? If others criticize you, it doesn’t mean that you have to do the same to others. Make your own choices about how you are going to treat people. Smile more and have the courage to be different. That is already a very good start.